“Operation Concern” is a Charity Organization registered in Hong Kong since 1994. Members consisted of orthopaedic surgeons, nurses, physiotherapy and occupational therapists and rehabilitation technicians. They went to remote village towns in China to offer free rehabilitation services for the disabled. The scope of service included nursing care, physical training, occupational training, rehab-aid fitting and surgery. The team of volunteers was composed of around 250 individuals who took turns to give free service during their own vacation. In the past 16 years, about 25,000 patients were seen, over 4,500 received surgery and 10,500 received training. Operation Concern aimed at training the local workers through active demonstrations in their charity service. Orphans were particularly welcome. Workers from China were also arranged to come to Hong Kong for exposure visits which lasted 2 weeks to a few months. Up to now around 300 had come for such short-term training in 4 hospitals. Operation Concern realized that the need in China was huge while its ability was limited. Nevertheless, the good-will practice did receive a lot of encouragement and support which supplied the energy for the volunteers to carry on. China made a lot of economic successes, but the development of medical service was seriously lagging behind. This has made Operation Concern’s contribution better justified. 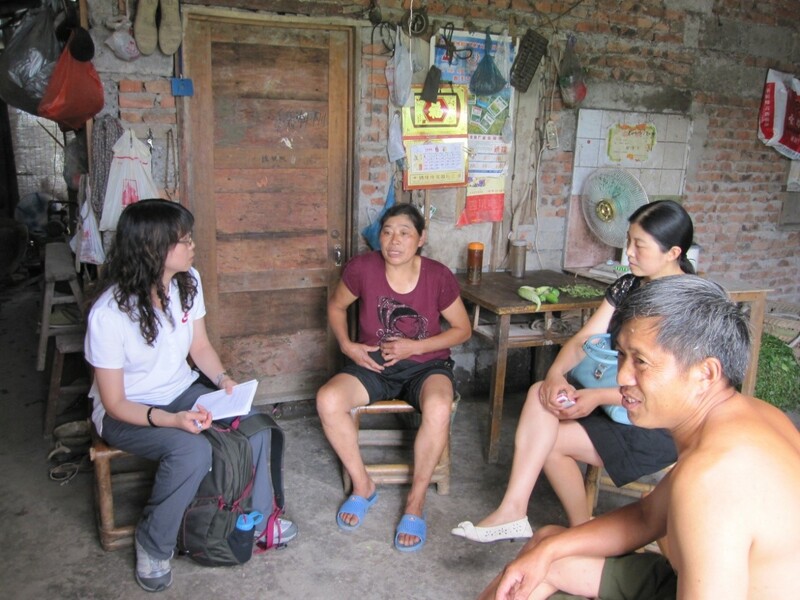 Operation Concern’s network with 10 provinces in China has made it quite versatile in its charity activities. During the 5.12 Sichuan Earthquake, Operation Concern was requested by one of its collaborating hospitals in the Quake Zone of Sichuan to send helping teams. 5 medical teams went in May and June to help caring for the injured and giving rehabilitation courses. After the acute phase, Operation Concern helped with the rebuilding of hospitals and schools. Two hospitals were thus subsidized in their rebuilding and renovation. Operation Concern is yet working on two main projects. The re-establishment by a Kindergarten is still underway. Another project offering medical support for 70,000 quake victims has been moving well for nine months. The 70,000 quake victims were peasants who lost their houses during the quake and were temporarily accommodated in shelters. They had problems with job, with education and with day-to-day activities. If they fell sick it would be unbearable. Operation Concern therefore offered to pay for their basic health insurance for the rural population (which costs 20 RMB per adult and 40 RMB per child) and, for those who really fell sick and hospitalized, Operation Concern subsidized each patient a sum of money at the ceiling of 2,000 RMB. Thanks to the Fu Tak Iam Foundation Ltd. for sponsoring this initiative. Professor Leung of Operation Concern comforts the admitted homeless peasant. Our Social Worker – Ms Chu visited the victims/patients regularly and observed “It’s good to stay alive!” That’s how she felt after visiting some two hundred patients over the past few months. During those visits to rural areas affected by the 5.12 earthquake, she saw families striving to re-build their homes, picking from ruins and fallen walls bricks and tiles that were still in good shape. Many Hong Kong people did reach out to offer help to victims of the earthquake, yet some survivors were still facing continuous adversities. After operation for appendicitis with the help of hospitalization subsidy, the homeless peasant returns to farming. The summer in Chongzhou had unstable weather. On a fine day she went up to the remote village of Wenjingjiang (文井江). The fresh mountainous air came with terrifying scenes after the 5.12 earthquake – landslides, fallen rocks, shifted slopes were all unbelievable sights. After bumping along a section of the earth track, she got off the car and walked up a trail. Fifteen minutes later, she arrived at Mr Wu’s house, with recent cement-filled cracks resulting from the earthquake. Aged just over forty, Wu looked like in his fifties. The breadwinner of a family of six, Wu suffered from Cervical disc herniation (頸椎間盤突出), giving him pain and weakness of the limbs. 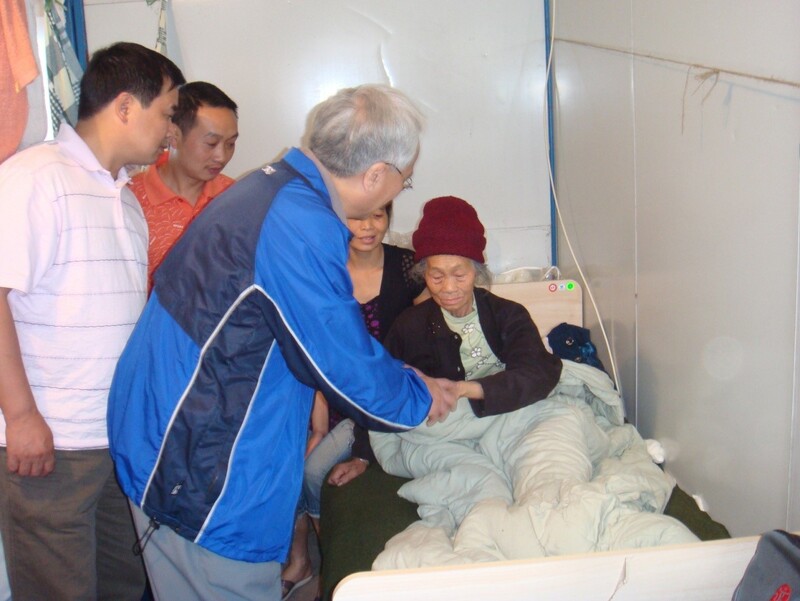 With a post-quake medical assistance of 2,000 RMB, he received an operation. He was now recovering and managed to take up part-time jobs in the vicinity, taking along his 25 year old son, who was found mentally handicapped while in kindergarten and had received no education since. During the visit, the son sat quietly next to the father, appeared to be listening, and nodded his head when encouraged to do so. Wu’s parents and his wife used to farm the land and grow crops, which provided enough food for the family. During our visit, they came back from the field, and eagerly offered us the nice cucumbers they just harvested. The 16-year-old daughter woke up during our noisy chat and walked out of the house. After being told by the mother of the occasion, she returned and greeted her with a nod. Wu explained that she stayed in bed recovering from an operation for appendicitis with 1,000 RMB assistance, and would return to school soon. When it was our time to leave, the Wu family lined up in front of their simple and modest home, giving her their warmest thanks. Life could be simple! Since the Fu Tak Iam Foundation Ltd. is supporting this project, Operation Concern has been able to comfortably sustain this project. In the first six months since the start of this relief project, about 1,200 victims enjoyed the hospitalization subsidy and 59,134 victims benefitted from the enrolling in the Health Insurance Scheme. The Sichuan authority heartily supported the joint venture between Operation Concern and Fu Tak Iam Foundation Ltd. and gave blessing for the project to continue another year, since the rehousing of victims was slow and livelihood could not be expected to resume normally until another year. Operation Concern is extremely grateful to the support given by the Fu Tak Iam Foundation Ltd., without which the relief project would not have been possible. Operation Concern vows to continue trying hard to fulfill the commitment.